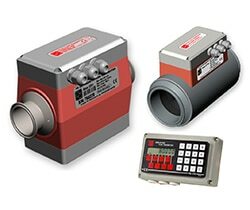 The PD340 Flow Transmitter from PROCES-DATA is an electromagnetic precision meter for the volumetric measurement of liquids that are electrically conductive. The transmitter can be used in applications where a hygienic design is required. The PD340 is the transducer of choice in industries where the highest standards in sanitation, hygiene, accuracy and reliability are of paramount importance. Industrial sectors ranging across the Dairy industry, Brewing Industry, Soft Drinks and Food, Potable Water, through to non-hygienic industries, where accurate measurement of a wide variety of conductive liquid chemicals is required.